The Karwood Retirement Retreat is situated in Paradise, the fastest growing Community in Atlantic Canada. It overlooks the gentle waters of Brazils Pond , and is surrounded by lights of the neighbouring cities and communities. We are very conveniently located within 5 minutes of Conception Bay South, Mount Pearl, Kilbride, The Goulds, and St John's, putting us in close proximity to major shopping malls, banks, and churches. 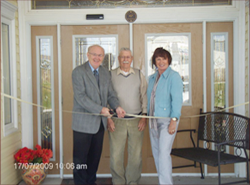 The Retreat offers everything necessary for seniors to enjoy a truly gracious way of life, providing various levels of assisted living. Dining facilities, lounging areas, library, beauty salon / barber shop, Chapel and many other amenities are available. It is our priority to make your lifestyle as comfortable and carefree as possible, all while ensuring your complete safety and convenience. Tours of our beautiful home can be arranged by appointment by calling the number below.